Images can be transferred to the metal in many ways. 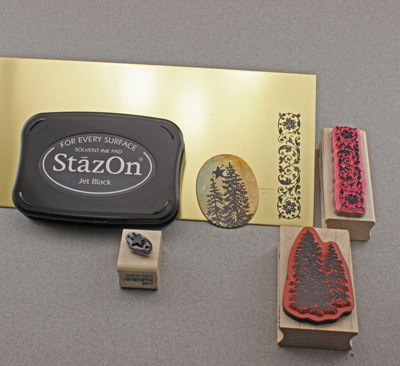 The easiest is to use a rubber stamp and permanent ink such as Stazon. You may also use a permanent marker like a fine point sharpie. 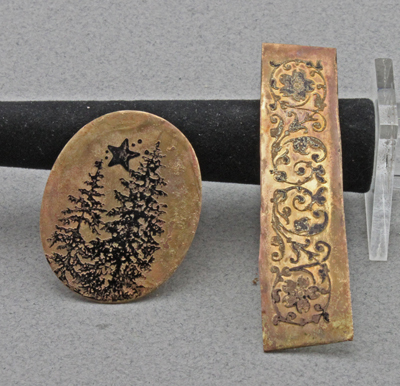 Another way to work is to spray the surface of the metal with lacquer and scratch through that to leave space for the etchant to get to the metal. The first method leaves a raised surface, while the second leaves a groove etched into the metal. The basic procedure is simple: put an image in permanent ink onto the metal surface. Thoroughly dry the image either with heat or time. Cover the back of the metal with masking tape to block the etchant. 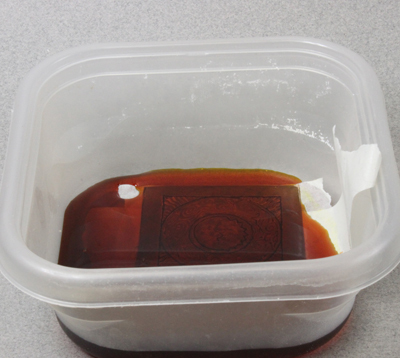 Then place the metal on the tape into a plastic or glass container. 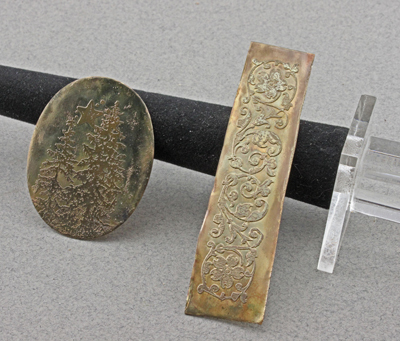 Carefully pour the etchant over the metal with sufficient depth to cover. Allow it to sit for at least 30 minutes in fresh solution. 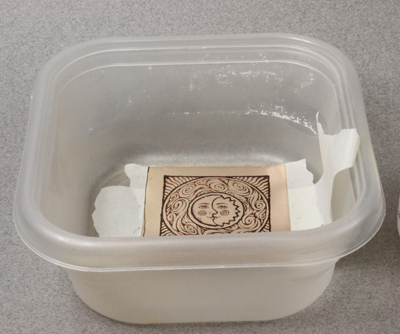 Then lift the tape and allow the etchant to drain off the metal. Check for a raised texture. 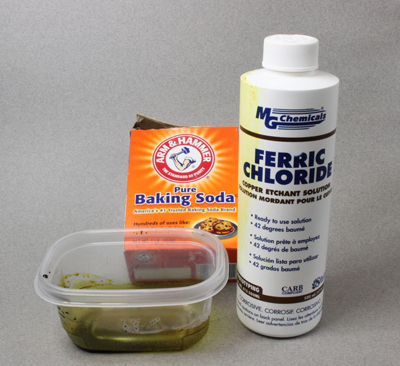 If it appears raised from the surface then you are ready to neutralize the solution by placing the metal/tape into a small pan of baking soda. Cover the metal and tape completely with baking soda. Allow it to rest in the baking soda a few minutes. 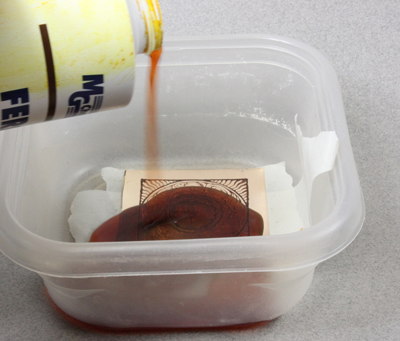 During this time cover the used etchant solution…it can be used again. Never pour it down a drain. It will etch or eat its way through the pipes. When etching times have lengthened to 24 hours neutralize the etchant with baking soda and put it, plastic container and all into a ziplock bag and put it in the trash. If your local laws require disposal at a certified hazmat site take it there. Brush the baking soda off the metal with a disposable brush and remove the masking tape. Store that in a plastic bag for later disposal. The metal should look like the next picture. I wear a dust mask for this next step. The dust from sanding can be irritating to membranes and eyes. I like to use a wire brush in a rotary tool to remove the scale from the image and to remove the left over ink from the surface. Polishing will often make the etched pattern more visible. Now you can get creative and use the metal to make your jewelry. I chose to make a ring from the long thin piece and a pendant from the oval. 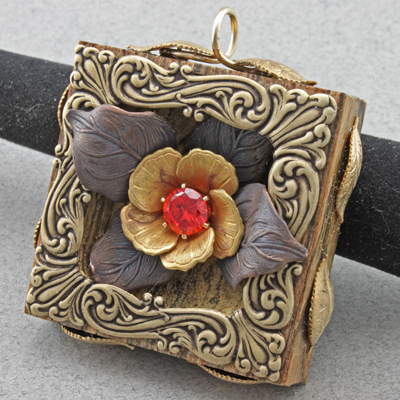 The square panel became the back for a multi-media pendant. The most important things to remember are safety first. Etchant is caustic but with care very safe. Any spills should be dealt with by adding baking soda. Work with good ventilation or outside if you can. And wear a dust mask when sanding or polishing the etched metal. Then of course be creative and have fun. I bought the etchant from Intertex Electronics Inc. www.intertexelectronics.com/PCB-Fabrication-C133.aspx This will take you to the best price for this chemical on the internet. 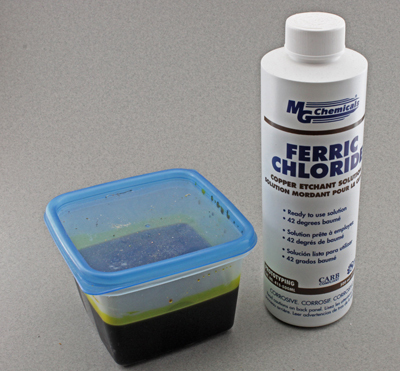 You can Google PCB Etchant for other sources but this was the best price I found.